Slice the ginger and spring onions into fine matchsticks. Chop the broccoli or kai lan stems into thirds, then blanch them in boiling water for 2 minutes. Drain and set aside. Slice the venison steaks into large 1–2cm chunks, put them in a mixing bowl and add all the marinade ingredients _except the cornflour. Using your hands, massage the ingredients into the meat pieces until they are well coated, then add the cornflour and repeat until everything is well combined. For best results, leave the meat to marinade overnight in the fridge. Mix the sauce ingredients together in a small bowl or ramekin. 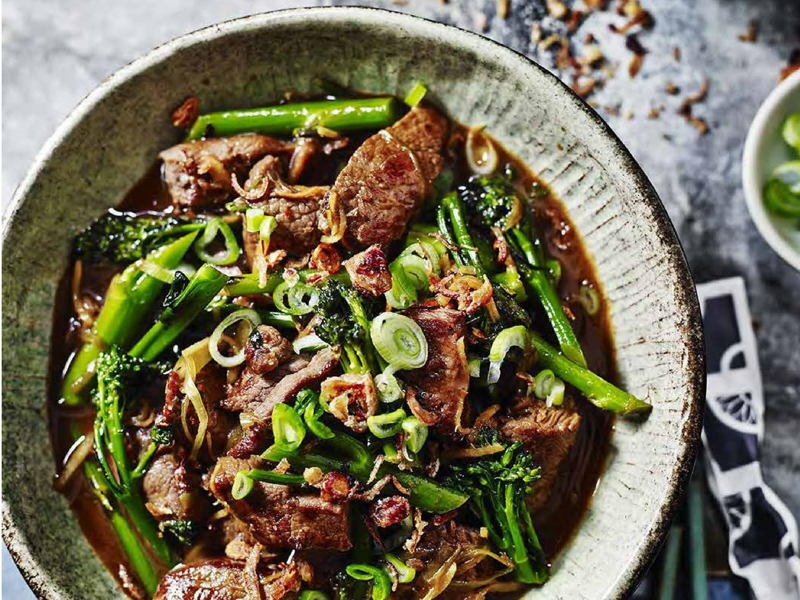 BUILD YOUR WOK CLOCK: place your sliced ginger at 12 o'clock, then arrange the spring onions, venison, broccoli, sauce bowl and deep-fried shallots, if using, clockwise around your plate. Heat 1 tablespoon of vegetable oil in a wok over a high heat until smoking-hot. Add the ginger and half the spring onion and stir-fry for 1 minute, until the spring onions have softened. Push the ingredients to the side of the wok, add the remaining 1⁄2 tablespoon of oil to the centre and return to smoking point. Add the venison, cover with the ginger and spring onions and stir-fry for 1 minute. Add the broccoli, pour over the sauce and bring to a vigorous boil. Cook, stirring, for a further 30 seconds, then spoon into a serving bowl. Scatter over the remaining spring onion and the deep-fried shallots, if using, and serve. TIP: Tamarind lends a dish its natural sour flavour and can be found in various forms: in its pods, with its seeds in a block of paste or as a sieved concentrate. If you use it a lot I recommend you buy the paste and thin it down with water yourself at home.